One third of French people say they are at least somewhat racist, an opinion poll suggests. The figure shows an eight percentage point rise in those who said they were racist in a similar poll last year. The survey of 1,011 people was carried out by the CSA polling institute for the National Consultative Commission for Human Rights. The commission said the poll pointed to socio-economic unease and suggested racism is gaining acceptability. France last year saw weeks of rioting in impoverished suburbs that was partly linked to the anger many youths from immigrant families felt at alleged racial discrimination. 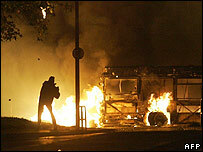 The survey was conducted in late November 2005 - just after the riots had subsided. Respondents were given five options for describing their personal stance on race, ranging from "somewhat racist" and "a bit racist" to "not racist at all" and "don't want to say". More than three in every 10 said they were "a bit racist" or "somewhat racist". Only 32% of people said they would notify police of racist behaviour they witnessed, compared to 50% in the previous year. "Despite the efforts deployed to fight racism, anti-Semitism and xenophobia there is still a long way to go," the president of the commission, Joel Thoraval, said. According to the report, anti-racist sentiment has grown weaker since last year. However, the report noted that the number of racist and anti-Semitic crimes had also fallen in 2005. France's justice minister, Pascal Clement, said last week that the number of convictions for racist and anti-Semitic crimes had risen 43% in 2005.